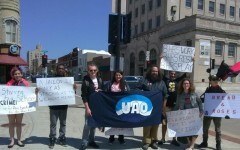 Oshkosh, WI celebrates International Workers Day | Fight Back! 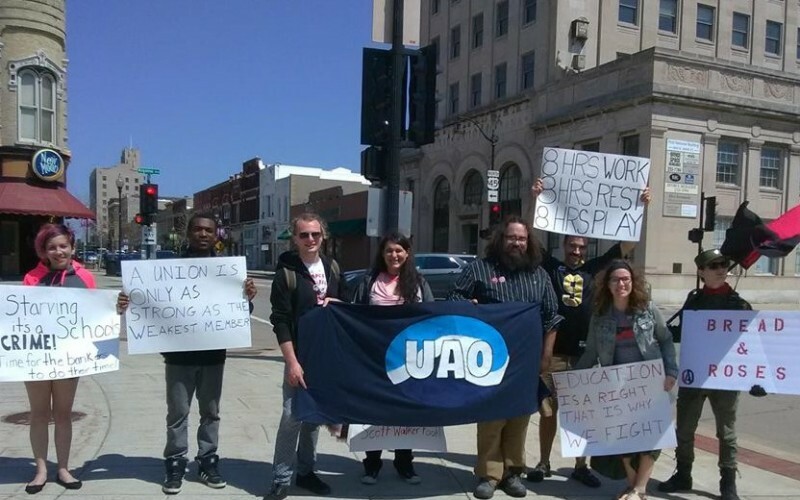 Oshkosh, WI – Members of United Action Oshkosh (UAO) and the community assembled on a sunny afternoon, May 6 to celebrate International Workers Day. The gathering not only served to commemorate this important international holiday in solidarity of workers across the globe, but was also a show of support for the strikes by teachers currently taking place throughout the U.S.
Held in downtown Oshkosh, the May Day event kicked off with a march down Main Street. Demonstrators proudly chanted and held signs which highlighted several key issues, among which were: achieving a fair living wage for all, increasing access to resources for educators and students, and standing up collectively to fight against the forces that deprive basic rights to workers everywhere. "Today we proudly marched in solidarity for the working class,” said Hollie Poupart, an early childhood educator at a local pre-K school. “We made our voices heard in honor of all who organized and still continue to organize around the country and worldwide." The momentum of the march continued as participants convened in the Opera House Square for several speakers while appreciation and support came from passersby. Ryan Hamann, a member of UAO, began with remarks about the history of International Workers Day and the need to remember its origins. Others spoke about the need to support organized labor and on how it is through unions that the working class can win benefits, better working conditions and higher pay. The celebration ended with a showing of the film Occupation, which illustrated the sit-in at Harvard University in 2001 orchestrated by students. The purpose of their action was to achieve a living wage for vastly underpaid workers, ranging from custodial to culinary staff. What led to the success of the campaign was the determination of the students and solidarity between the students, campus workers, faculty, as well as with organized labor. The short discussion that followed the film noted the importance of continued and persistent action to achieve such notable change here in Oshkosh. The May Day march is one of several events to be hosted by United Action Oshkosh in the coming months. Moving forward, the group plans to end the month with a community solidarity event to celebrate Palestinian culture and history. Additionally, efforts by UAO in its campaign for Oshkosh to become a sanctuary city will continue with the date for the second sanctuary city workshop set for June 2.